On Facebook, the guys offered tickets for 5£ instead of 7 for Wednesday's gig in London. The new album is provisionally titled "All Lost Time" ! Gig in London on December 16th! Happy new year to all of you! First gig announced for 2012: London, on the 24th March! 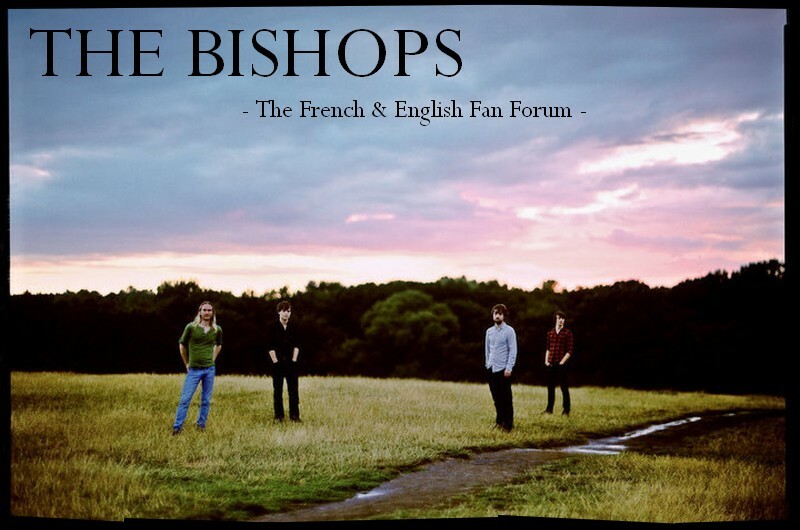 first five people who come to the entrance and say The Bishops get a free Bishops cd. The Bishops will be at Crooked Ways Festival on 26th of May! The new single will be Polygonn, the guys already played this one live. Nick Black and Ben Aston work on the video, they already worked on the one for Nowhere To Run previously. New gigs in May, one free in London and one in France! My review (in French, sorry) for the Flèche d'Or gig is online. Unfortunately, Alex wasn't at this gig and it seems that he has left the band. I'm waiting for an answer by the guys about why he left. Unfortunately, he couldn't do both jobs, so we wish him all the best in his new career! A new Alex, Alex Sorenti, will join the band on the next tour, he plays guitar and keyboards. The new album is ready but the release date is still unknown. One gig in Leeds and two in London, see the calendar for information!